Initial dog bite treatment can help prevent infection. Contrary to the legends about a dog's mouth being sterile or cleaner than a human's, researchers report a 10% risk of infection in bites of any kind. The risk of infection is not only due to bacteria in the dog's mouth. There are millions of bacteria present on human skin. Staph is one of the most common and can cause a serious infection. To reduce the risk of infection, wash the affected area with warm soap and water. Pat dry with a clean towel and examine the wound for dirt or other materials. Cover the wound with an antibiotic ointment like Neosporin. If you have none on hand, you can use Vaseline or even honey as a temporary solution. The lack of water in Vaseline and honey may help prevent bacteria from growing. Some varieties of honey actually have antibacterial activity. Manuka is an example according to research. The honeys have been investigated as treatments for antibiotic resistant staph infections. Whether you keep Neosporin or manuka on hand, you should keep some kind of antibacterial ointment if you are a pet owner in case you need to provide dog bite treatment (for a person or dog that is bitten). Most bites occur in the home and involve family members. As a responsible pet owner, you should be familiar with dog bite first aid. Once the area has been washed, the wound has been examined for dirt and the antibacterial agent is applied, it is time to dress the wound. Applying a bandage is important, regardless of size or the amount of bleeding. Keeping the area covered further reduces the risk of infection. The bandages should be changed regularly and the wound examined for signs of infection. Redness, pus and warmth are early signs of infection. Red streaks or lines may indicate the infection is spreading. If the infection spreads into the bloodstream, it could lead to a very serious condition called sepsis. Wounds with oozing or spurting blood may require professional dog bite treatment. Stitches may be necessary. Once the first-aid is taken care of, it is essential to seek professional help for any animal bites unless the animal's rabies vaccine is known to be current. Bites by strays should be reported to your local animal control center as soon as feasibly possible. The animal control officers will ask questions about where the injury occurred and what the dog(s) looked like. The officers will attempt to find the owners in order to find out about rabies vaccinations. 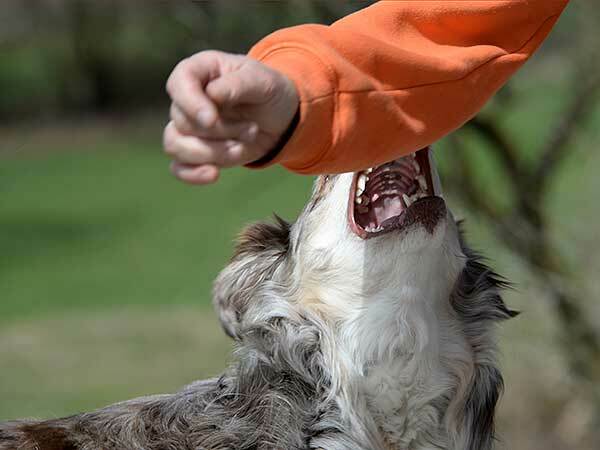 If the animal is known and the rabies certificate is up to date, you could call your physician's office for dog bite first aid advice. Describing the wound can help your physician determine if additional medical care is necessary. Hospital emergency rooms are well-equipped for providing dog bite first aid. US emergency rooms treat some 800,000 bites per year. Preventing rabies should be your primary concern. Carefully washing the area with soap and water for at least five minutes is effective for reducing the viral particles. Iodine and alcohol have proven to be effective for further reducing the virus's activity in some studies. Finding the animal's owners can allay any fears concerning rabies. However, post-exposure prophylaxis (PEP) treatments should not be delayed in order to try and find the owner. PEP treatments are 100% effective, but only if the series of shots begins within six days of the injury. Other treatments, including induced coma, are still in the experimental stages. If you are the dog's owner, you should make every effort to re-train. Biting is never acceptable behavior. If the victim was your child, you should explain how to avoid being bitten in the future. The SPCA has programs for teaching children the basics of animal safety. Taking the time to learn those basics should reduce your need for dog bite treatment in the future.